Last night was one of the twice a month transgender - cross dresser support group meetings. It was sparsely attended due in no small part to a couple of regulars who are in the hospital. One had a heart attack and the other just went through a complex operation to remove a brain tumor. Both had the habit of adding quite a bit to the discussions. Fortunately (or not) I was able to step in with discussions of my own. The first had to do with volunteering to work the front door at this years' Cincinnati Witches Ball Halloween party. As I wrote before, my request was met with shock by the lead organizer. On the spur of the moment, I decided I was not going to sit on the sidelines anymore and to hell with being trans...I was going to step up. The rest of the meeting became so dis-orientated due to internal squabbles and a very noisy young boys basketball team who disrupted everything else. At the least, I am satisfied I stepped up to help the ball and volunteer for a very important and complicated job. For the last several years, we have also set up at Cincinnati Pride, which has become a huge event and I volunteered to get us registered for that. It too was lost in the dust of the mess of a meeting. Oh well. 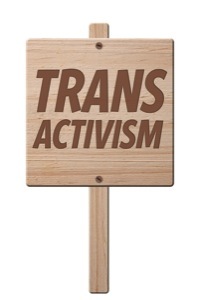 My first topic last night involved my quest to present a workshop again at this years 2019 Trans Ohio Symposium. I have decided gender dysphoria will be my central topic. My proposal has to be in by Thursday. Ironically, one of my assumptions about dysphoria was shattered by the moderator of the group last night. When I mentioned what I was going to try to do, she stuck her nose up in the air and said she had never experienced any Mtf gender dysphoria at all. We got into a brief give and take about what dysphoria really meant and how it was possible she never felt the pulling and tugging of the two main gender binaries. It was an eye opening experience for me. Finally, towards the end of the meeting, we somehow ended up discussing how Victoria's Secret doesn't use transgender models and even how I don't support Chick Fil A with any of my money. Of course she said she does because she considers herself a role model of sorts for trans people everywhere by proving she could eat there. I simply said since she does have quite a bit of passing privilege, her attempts were wasted because no one knew anyhow. All she was doing was contributing to the profit margins of an anti LGBTQ company. After another person said if we stop going to all the companies who don't support us, we wouldn't have any place to go. I had to step back in and point out that wasn't true either. Cincinnati alone has several big companies who are pro LGBTQ including Kroger grocery stores, Fifth Third Bank, Procter and Gamble and Pure Romance. So, all in all it was an exciting couple of days. Really, though, those discussions don't sound so "moderate." I would have loved to have been in on them, and to know more about this supposed moderator. I do know that a moderator should not turn a nose up to anyone's expressed thoughts, however. She is just one of those people who are pretty sure they are better than others but covers it in a veil of wanting to help. Cross gender expression and presentation, in the absence of gender dysphoria, is - to me - pure cross dressing. I can only speak from my own experiences and acquaintances, but I have enough anecdotal evidence to, at least, theorize on this. There was a time, before I began my transition, that I actually expressed my admiration to cross dressers. The ones I knew seemed so happy just to get all dolled up for a Thursday night out "with the gurls" and then go back to their regular male lives the rest of the week. That was in contrast to my waking up Friday morning (and every morning), feeling so very deflated that I was about to face the world behind my male facade. I used to think that I just didn't have the same grip on reality as they did, and that the dysphoria I had always had was something that needed to be overcome. Most of us who have gender dysphoria, whether we admit to it or not, will learn that it can't be overcome; over-ridden by willpower, maybe, but not overcome. It was with us at birth, and it will remain until the day we die - and may be the very thing that is the cause for dying, sadly. I still don't know if it might just be varying degrees of gender dysphoria that make the difference between one being a cross dresser or transsexual (for lack of a better term). Was it dysphoria that led me, at a very young age, to be attracted to feminine things like makeup, jewelry, and dresses? I certainly had a sense of euphoria when I put them on, but I don't know that euphoria needs to be a counter to dysphoria. I do know that the dysphoria was recognized when I began puberty; when my body started changing to something I was not happy to have. The dichotomy of a testosterone surge against my deep desire to grow into womanhood was only tempered by cross dressing experiences. The biggest fete of my life was to, at seventeen, decide to suppress my desires and maintain it for another seventeen years. The darkest period of my life was the next seventeen years, when I attempted to use closeted cross dressing to deal with my dysphoria. Like a drug addict, though, I was only maintaining, and I eventually took the leap to going out of the house as a way to find the fix that would bring back that euphoric feeling. Hanging out with cross dressers soon lost its luster for me. I enjoyed myself, to be sure, but I still could see differences in our individual motivations for expressing our femininity. After about a year of attending events with this group, one of them asked me a question that really set me on the course of transition. She asked if I were going to disappear, as others had done, because I wasn't feeling the gratification of being involved with a bunch of "mere" cross dressers. Well, yes, I had already determined that I was not like most of them. My femininity was not dictated by a series of events at which I was participating. Those were just things that I had been doing, but I finally learned that they were only a part of who I was. When Thursday nights became the trans version of the movie, Groundhog's Day, for me, I did make my exit from the group. Interestingly, though, the few I did try to maintain relationships with ended up disappearing from my life within a short time, as well. Although my theory of dysphoria/euphoria is in need of more development, I have found a balance in my own life that causes me to not really care anymore. My gender dysphoria will always be there, but it has become less of a motivation toward what I do to alleviate it; more just a part of who I am that is as innate as my compulsion to breath. Funny, it took finding who I am to be able to really breath.